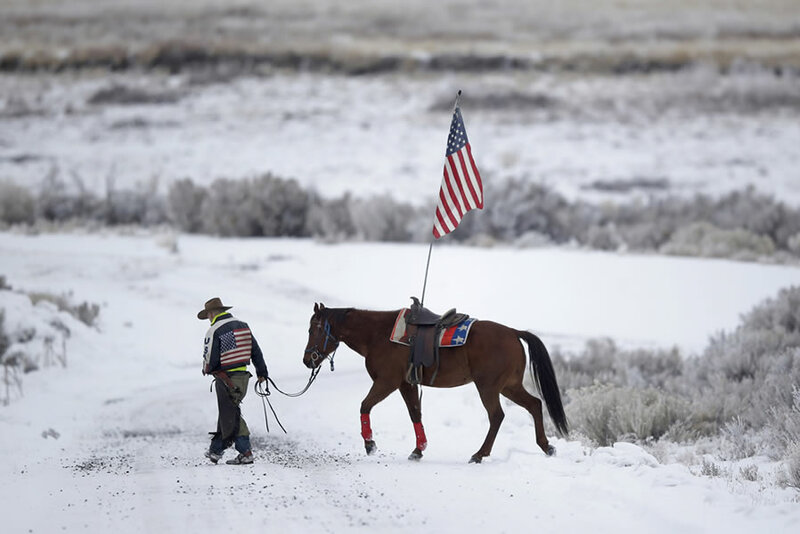 Cowboy Dwane Ehmer, of Irrigon, Ore., a supporter of the group occupying the Malheur National Wildlife Refuge, walks his horse near Burns, Ore., on Thursday, Jan. 7, 2016. The group has said repeatedly that local people should control federal lands, but critics say the lands are already managed to help everyone from ranchers to recreationalists. The recent standoff at an Oregon wildlife refuge has placed a spotlight on the federal government’s history of obtaining private land, particularly in the Western states. Many imagine that all the federal government owns is several prize national parks and national forests and a select few wildlife preserves in ecologically strategic locations. In fact, the amount of land owned by Uncle Sam out west is almost unimaginably greater than this. The federal government owns a relatively modest if still sizable 4 percent of the land in Eastern states, but it owns 48 percent of the land in Western states. One need not be a fan of either the Hammonds or the Bundy bunch to wonder if it isn’t time to rethink the size of the federal government out west. The U.S. Supreme Court held in the far-reaching 1976 case Kleppe v. New Mexico that Congress had vast power to regulate in this area, preempting the states: “The complete power that Congress has over federal lands under this clause necessarily includes the power to regulate and protect wildlife living there, state law notwithstanding.” The court said the regulatory power is authorized by the Property Clause of the Constitution, which states, “Congress shall have Power to dispose of and make all needful Rules and Regulations respecting the Territory or other Property belonging to the United States.” This decision was the culmination of a gradual broadening of the interpretation of this clause over the last century, despite the objections of many constitutional scholars who believe it goes well beyond the original intent of the Constitution. About the same time, Congress passed the Federal Land Policy and Management Act of 1976, declaring that the remaining public domain lands would remain in federal ownership. This prompted the Sagebrush Rebellion, a movement by rural landowners that started in the late 1970s with the goal of transferring federal land and management decisions to state and local authorities or private entities. However, it was not successful in changing policy and also failed in lawsuits. Congress has authorized these sweeping land grabs by federal agencies in part because members of Congress often don’t read entire bills. They’re frequently thousands of pages long and difficult to understand — written for specialists, not the average educated person. They are presented to members to read sometimes just a few hours before voting. The federal government owns a higher percentage of land in Nevada than in any other state, almost 85 percent. Two other states with significant federal land include Colorado, with 36 percent, and New Mexico, with 35 percent. U.S. agencies manage the land, primarily the Bureau of Land Management, National Park Service, Forest Service and Fish and Wildlife Service. BLM owns the largest share, close to 36 percent. The primary method these four agencies use to seize land is by congressional appropriations from the Land and Water Conservation Fund. Even though the federal government owns more land in Nevada than any other state, it continues to seize more. The bad press from the Cliven Bundy standoff over access to land for grazing has not seemed to have made much of a difference. Last fall, the U.S. Air Force condemned and seized the valuable Groom Mine property owned by a family near Area 51, despite their vocal objections. In 2014, Obama seized half a million acres of land in New Mexico and designated the property a new national monument, the Organ Mountains-Desert Peaks National Monument. Due to its location along the U.S.–Mexico border, there are valid concerns that it will become a haven for drug smugglers, as is happening in Arizona near the border within the Organ Pipe Cactus National Monument. Starting in 1908, the federal government began giving rural counties with large areas of federal land some money back from the income generated off the land. This is because the counties were unable to tax the federal land, and without a reasonable tax base, could not afford basic governmental functions such as public schools. It became known as Payment In Lieu Of Taxes (PILT) in 1976 legislation. It hasn’t amounted to a lot of money, but it’s enabled small, rural counties to continue to exist. Part of the reason there has been little success reducing the federal government’s takeover of rural land is because the vast majority of Americans do not live in these sparsely settled areas, so it does not seem to affect them. Every year, Democratic members of Congress from the heavily populated Eastern states object and try to end the PILT transfers, claiming they favor rural Western states. The Republicans and members of Congress from Western states respond and suggest that the best way to eliminate PILT is to return the federal land to local and state control or private owners. Rep. Grade Walden (R), a moderate Republican who represents Western Oregon, spoke for a few minutes on the House floor on January 5 about the history of the federal government’s involvement with the land, listing off a series of abuses that has taken place over the years. He said the BLM trespasses on private property, starting back fires without permission that sometimes puts the lives of residents in danger. The federal government now owns more than half of his district in Western Oregon. He recommends changing the law so it cannot be abused against ranchers. State control would mean less regulation and greater freedom for ranchers, miners, recreationists and others, boosting state income. There are concerns that access would be cut off to the public — but much of the federal land already is cut off to the public. Many private owners would be all too happy to allow access to their land for a minimal fee, or welcome a road through it which would also benefit themselves. Instead of land being designated only for certain purposes such as wilderness, it would be designated multi-use and available for activities like hunting and fishing while preserving mining and grazing rights. Reducing federal land ownership can be done. It has actually declined by 3.6 percent since 1990, primarily due to the BLM turning land over to the state of Alaska, Alaska Natives, and Alaska Native Corporations. Of course, the federal government still owns 61 percent of the land in Alaska. Some states are taking things into their own hands. In 2012, the Utah Legislature passed the Transfer of Public Lands Act, sponsored by Representative Ken Ivory (R), an outspoken proponent of returning federal lands to the states. Ivory started the American Lands Council for this purpose. His legislation required the federal government to give Utah back 20 million acres of land, most of the land in the state, as provided in the Utah Enabling Act of 1894, by the end of 2014 — but the government did not comply. So far, the state has not sued. The state of Colorado is taking a middle approach, passing legislation that would give the state a role in managing federal lands, while not giving it full ownership. A massive rollback of federal land ownership is possible without ever touching cherished national parks and forests, which make up only a small fraction of the total. Returning land to private ownership doesn’t mean environmental rules disappear. And mounting evidence suggests that increasing private ownership would improve environmental stewardship while increasing resource independence. This would give young cowboys opportunities to realize ranching dreams, and allow the federal government to make a sizable dent in a national debt that threatens to cripple America in the next generation. US governments both federal, state, and local have gleefully abused eminent domain to the detriment of the country!